The Haaga 600 Professional Line MasterSweep Series with rechargeable batteries take sweeping to its highest levels and are especially suited for areas starting at 200 square meters. 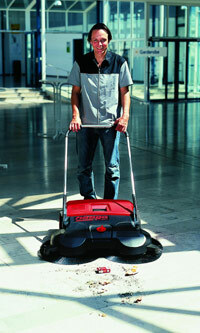 Powerful 12V rechargeable battery provides up to 90 mins sweeping time or optional manual operation. The Haaga 600 Series Electric or Push Sweeper is the revolutionary back-saving, time-saving tool for quick and thorough sweeping without sweat and effort... just push and clean. works by Turbo sweeping system. Battery powered or manually operated. Two counter-rotating discs plus brush roller. Turbo sweeping system. Battery powered or manually operated. Two counter-rotating discs plus brush roller. Hopper size Bigger hopper allows more debris collection. Bigger hopper allows more debris collection. Best for Best for professional applications in large areas that may also have narrow passageways. Best for professional applications in large areas that may also have narrow passageways. Suitable for all types of large and small debris. Indoor and outdoor use. all types of large and small debris. Indoor and outdoor use. Battery 12V Rechargeable Battery or Manual. Approx 90 mins fully charged. 12V Rechargeable Battery or Manual. Approx 90 mins fully charged.